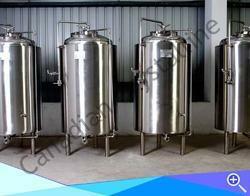 We are a well known manufacturer of Bright Beer Tank. From past many years, we are occupied in offering premium quality Bright Beer Tank. Bright Beer Tanks are also referred to as maturing tanks and are also made of SS 304 or SS 316 as desired. These tanks are designed with a dish bottom and is equipped with dimple jacketed glycol cooling system and insulated with 50 – 60 mm polyurethane foam. Tanks are fitted with high quality solenoid valves that regulate tank temperature. Moreover, clients can get the provided range from us at very affordable prices. Looking for “Bright Beer Tank”?